Battler of depression for 4 years. 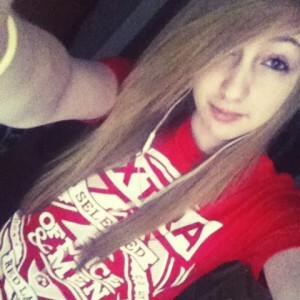 Favorite band: The Color Morale. They've saved my life. wow, I haven't been on here in hellas. I wish everything you said and did actually meant something to youlike it has to me. "Hey babe, I love you okay? You are an incredibly tough girl, you're absolutely stunning, and you brighten up the room, you're lovely, you give me hope, you are just..... Asdfghjkl and I can't thank you enough for being an inspiration to many." I woke up to this, this morning on my Ask.fm for my scenebarbies IG. But what's the point in living, when you can't even live with yourself? Crying because the video Coming Down by 5FDP is so sad. It just shows that having one friend can save you.. I dare you all to watch it, even if you don't like metal. If you don't cry, you have no heart. You take it all, and leave me nothing. What about us'til the end?What about love? You cut my wings, now I am falling. I never new such a great friend could ever be so selfish. LOL at my posts on Vine and Gifboom. Like, wtf am I even on? Dad: *driving* Oh my gosh, I almost ran over a turtle! Me: TURN AROUND. I WANT TO KEEP IT. Dad: You can't just do that Lauren. That's just taking it out of its natural habitat! That's just like some stranger picking you up off the street and keeping you! Philip: yeah! He's probably going to go smoke some turtle weed wih his friends! You'd ne ruining a good time for the little guy! If I left, none of you would care. None of you would notice. and follow our YouTube channel? You fell over my love. because the blade is her only best friend. Don't ever leave a girl you need, for a girl you want. Nicole: *burts out laughing* oh my gosh, just like Jake from State Farm! !